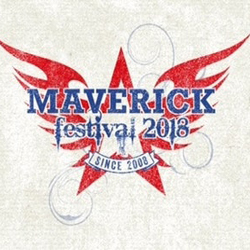 Maverick Festival officially unwrapped the line up for their 11th year at a launch party held at the Gibson Guitar Studios in London last Thursday. The festival, winner of several awards and generally reckoned to be one of the best Americana and roots events of the year will take place in July in the tranquil acres of Easton Park Farm in Suffolk. Hosting the launch night was the festival’s co-founder, director and driving force Paul Spencer. A particular theme this year is the music of Hawaii so no easy references to Appalachia or the Delta to be had here and impressively the name of Kehau Kahanahui tripped off Spencers’s tongue. Intriguingly, key elements of the Hawaiian theme will feature UK stalwarts Hank Wangford and BJ Cole, both of whom have close ties to the 50th state. Also flagged up were emerging Memphis band Southern Avenue, the eclectic talents of Hans Chew and the ever popular Danny and the Champions of the World. Music on the night was provided by the punchy sound of Don Gallardo, warming up before his later gig at The Betsy Trotwood; the standout from his polished blend of roots rock, country and bluegrass was ‘Banks of the Mississippi.’ He was followed by Tom Attah, who introduced himself as, “a black man in a suit playing acoustic guitar so I’m going to play some heavy metal.” So three parts factual to one part irony. He played a convincing take on some of the classic Delta bluesmen. As ever Spencer is confident that the 2000 tickets will be sold out and as a reminder that festival goers need actual as well as musical nourishment the renowned Maverick duck wraps were in plentiful supply as were southern themed cocktails courtesy of one of the festival partners, Southern Comfort. Full details of the line up and tickets are available here.